Small Glue Stick - 0.29 oz. Medium Glue Stick - 0.74 oz. Large Glue Stick - 1.41 oz. Forms a strong, long-lasting bond with just a single stroke. Goes on smoothly with no clumps. 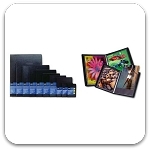 Lets you create neat, tidy photo albums and scrapbooks quickly and easily. Acid-free and photo safe. Ideal for paper, cardboard and photos. Dries clear. Washable.